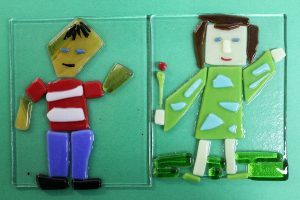 Make a self-portrait in glass. By using the already cut glass body parts and facial features, each participant will be able to produce a humorous or serious self-portrait. There will be numerous glass pieces to choose from so you can make it look just like you. This class usually turns out to be a blast with a very interactive feel. Call us today at 920.751.4658 to plan your activity. 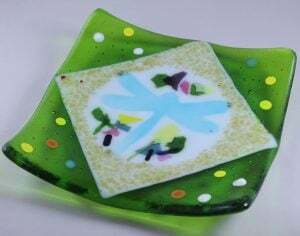 Create a Fused and Slumped Glass Platter to brighten up the desk at your office. Learn the basics of glass plate making while bonding with your team. You will be supplied with a 6’’ x 6’’ colored glass sheet of your choice along with various pieces of colored sheet glass and glass decorations. Platters will be fused after class and ready for pick up on a later date. 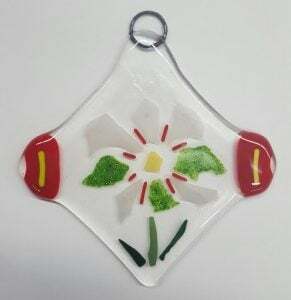 Create a Fused Glass Sun Catcher or Ornament with a clear base piece of glass and various pieces of colored sheet glass and decorations. You will add a copper ring at the top so you can hang your finished piece in the window or anywhere you like. Sun Catchers will be fused after class and ready for pick up on a later date.